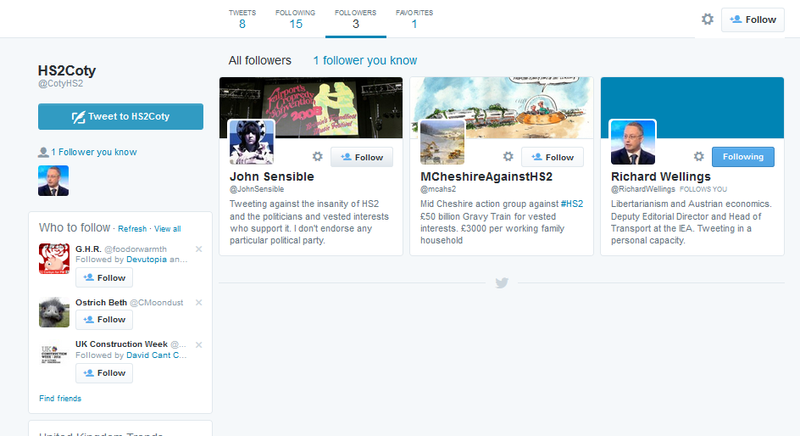 Here’s why the anti Hs2 mobs Twitter campaign’s a joke. Having utterly failed to make any impact in the real world the anti Hs2 campaign’s increasingly become a cyber campaign that’s almost totally reliant on social media to try and get its message out. Their problem is – they’re mostly shouting at each other. I’ve long said that their daft & desperate campaign will be an object lesson in how not to do it and here’s another of their masterclasses. 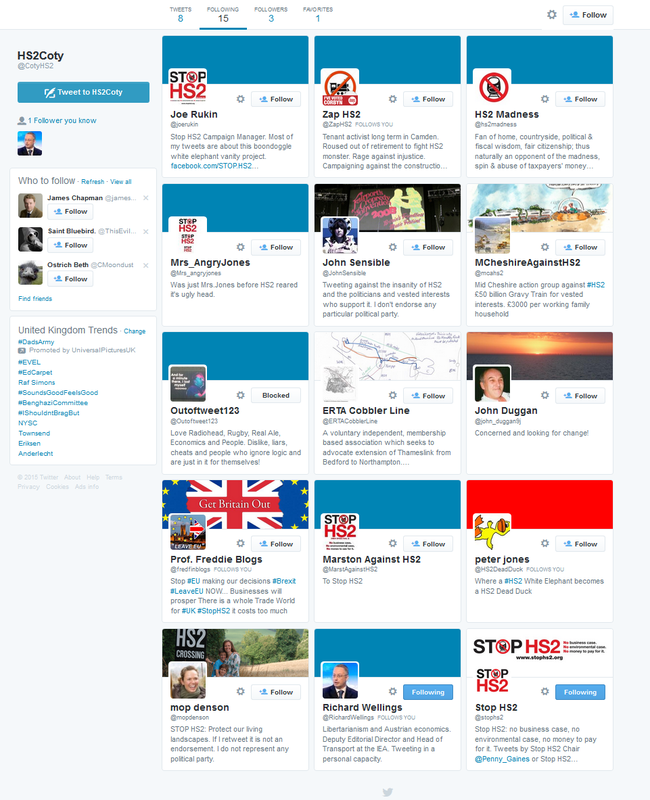 Having failed to gain much of a following on Facebook (see here) Hs2 antis have increasingly fallen back on Twitter. There’s a certain logic to this. In theory, it’s easy to pretend there’s a lot of support for your aims. Setting up a series of accounts that feed off each other to all retweet the same rubbish seems like an attractive idea. The difficulty is there’s obvious pitfalls that the ignorant or unwary can fall into – and the anti Hs2 mob do that every time! Some other anti’s started to follow back almost straight away. One of the first was the IEA transport ‘economist’ Richard Wellings who’s a bit of a tart. He’ll follow anyone to try to make himself look more important and influential. If you don’t believe me, take a look at his Twitter bio. It’s so obvious that this account is nothing but an anti Hs2 mob propaganda tool and not a real person it’s positively painful. This is why campaigners should never fool themselves into thinking a fiddled social media strategy is going to influence anyone. It’s nothing better than mutual masturbation. It might give them a warm glow but the people they think they’re influencing aren’t stupid. They have the ability to analyse metrics that show the anti Hs2 campaigns reach is tiny – and mostly ranting at itself rather than influencing outsiders. After five years the anti Hs2 mob still haven’t learned the lesson but campaigns that follow them will ignore it at their peril. It has less than 7000 followers. Many of their comments are priceless. Does this look like an energetic & focussed campaign with a clear strategy & political will? They wish! Instead it’s a wonderful insight into the soul of their campaign, which consists of a few bewildered folk who have absolutely no understanding of the issues & simply can’t understand why no-one is taking them seriously. They remind me of the Duke of Wellington’s famous quote “I don’t know what effect these men will have upon the enemy, but, by God, they frighten me”.